We're a culturally diverse congregation meeting in Bukit Indah and committed to the Great Commission. We welcome people of all nations and races to come worship together. 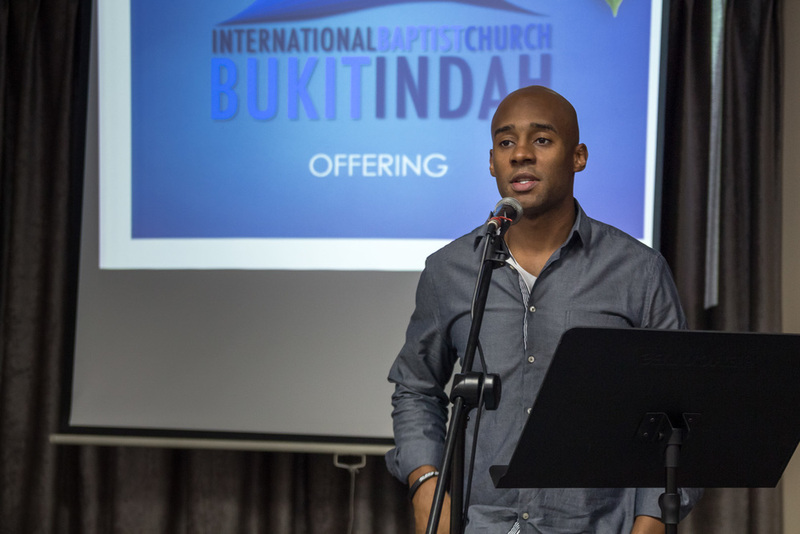 International Baptist Church Bukit Indah started December 2012 as a small Bible study meeting once a week. We've since grown to a thriving community of believers dedicated to worshiping God, loving one another, and loving the community. Our aim is to make disciples—not merely followers—of Jesus Christ who in turn disciple others. We welcome people from every country, race, and people group to become disciples of Jesus Christ and worship God together. We aren't satisfied with growing larger—we want to multiply ourselves throughout Johor Bahru, Malaysia, and the world. Our teaching originates from the Bible and is subject to its authority. Our preaching is expository, taking the main points of a Scripture passage and making them the main points of the sermon. Our theology is rooted in the authority of the Bible and our beliefs strive to accord with Scripture. All people everywhere need to hear the life-changing news of the gospel. We preach the whole gospel and call people of all races, nationalities, and countries to repent of their sins and trust in Christ. Believers are compelled to share the gospel with others and pray that God will bring salvation. The church is the body of Christ on earth and displays the glory of God. Baptized believers commit to a local church in order to preach, worship, fellowship, give, grow, serve, and minister. Believers unite with the global church at conversion and also commit themselves to individual, local churches. Baptism is the immersion of a believer in water in the name of the Father, the Son, and the Holy Spirit. It is an act of obedience symbolizing the believer's faith in a crucified, buried, and risen Savior, the believer's death to sin, the burial of the old life, and the resurrection to new life in Jesus. It is a testimony of faith in the final resurrection of the dead. The Lord's Supper is a symbolic act of obedience whereby members of the church, through partaking of the bread and the cup, memorialize the death of Jesus and anticipate his return. With Jesus Christ as our Head, we keep members accountable to one another and accountable to God through preaching, teaching, prayer, worship, relationships, and godly oversight by elders. We exercise church discipline with the purpose of bringing restoration between individuals and God. God created men and women in God’s image to know Him. We sinned against God and as a result all people are born sinners and under God’s just wrath. God became a man in Jesus, lived a perfect life, and died on the cross. In Jesus’s death he fulfilled the law and took upon himself the punishment for sins. He came back to life, showing that God accepted Christ’s sacrifice and that God’s wrath against us had been exhausted. God now calls us to repent of our sins and trust Christ alone for our forgiveness. If we repent and trust Christ we are born again into a new and eternal life with God. Jesus commands us to make disciples. We make disciples of all nations, baptize in the name of the Father, Son, and Holy Spirit, and teach them to obey all that Christ commanded. We are concerned about members growing spiritually as well as numerically. The body of Christ makes decisions concerning the direction of the church through the leadership and power of the Holy Spirit. All members are a kingdom of priests before God, serving together for the glory of God. The congregation prayerfully sets apart leaders through the Holy Spirit to fulfill the biblical roles of elders and deacons. Elders shepherd and teach the church. Deacons serve the church. Believers have access to God and communicate with Him in prayer. We are committed to finding our strength, direction, focus, and vision through continual communication with God in prayer. In Heaven there will be people from all tribes, languages, and nations around the throne of God. Our members come from different backgrounds, countries, and ethnic groups. As the body of Christ and the family of God, Scripture commands believers to be unified. The church should present to the world the multicultural model displayed in the book of Revelation. Subscribe to our sermon podcast via iTunes or RSS. Photos by Anthony Rivers ©2016 unless noted.